21 Today Birthday Sash GAFS21P. What a great way to help her celebrate the 21st birthday. Flashing sash! Celebrate the big day by getting the 21st Birthday Girl to wear a Miss America style sash. This is a fun coming of age gift. 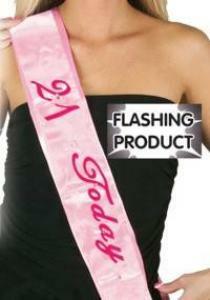 Bright pink flashing 21 Today sash with padded lettering. 5 bright red flashing LED lights. 30 inches long and 3.5 inches wide. On/off switch. Battery Included. Birthday party supplies. Gas Works.